Please use the Menu on the left to find the page you want. This is my personal “Electronics Log Book” website which is being developed (13+ years now) purely as a more convenient way of storing and searching for all my electronics information. This is better than having a collection of folders, files, documents, spreadsheets, pictures, etc, saved on my PC, Laptop, Server, iPad and Backup Drives. For me electronics is a challenging and fascinating hobby. To others, no doubt it is possibly boring, but hey that's their problem. Electronics is my main interest although electrical and mechanical engineering also feature. Finding out how things work by taking them apart and fixing them, is what engineering is mostly about for me now. I really hate bad design! If anyone else finds my website interesting that's a bonus. If you have any comments or spot any errors, please Contact Me by webmail. Thanks to everyone that has been in touch, the world-wide 'electronics' community are a friendly group of enthusiasts and often go to a lot of trouble to help each other. As well as all the webpages listed from the Menu on the left, there are many more webpages listed under Site Map which includes test equipment from various manufacturers, although HP (Hewlett Packard) is my main area of interest. Also please check out my items For Sale page which gets regularly updated. There are also items on my Wanted page that I am looking to acquire. Because I lived on the Cote D'Azur in the south of France. My favourite colour is blue and A to Z covers the whole range of this 'electronics' subject, plus a few Greek letters! 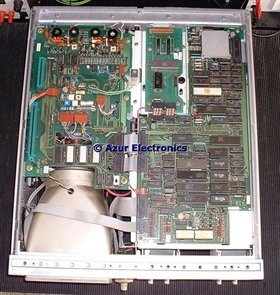 Is AZUR Electronics a Company? No and I don't want it to be, no red-tape or stress for me anymore! This is very much a part-time retirement hobby and definitely not a new business venture.